wooooo hoooo!!! Thanks again for the awesome party, amy sue! OMG!!!! is an understatement!!!! I want to apprciate Amy and Amillia for providing all of us the opportunity to co-create community around the steelers and that crazy super bowl game. What I shared with all of you was very rich, full and deeply meaningful. I loved sharing all the rises and falls of the game and our emotional responses. It was awesome. Thanks to all of you who gifted such yummy food. I woke up Monday morning both elated and exhausted with a sore neck, shoulders, blisters on my feet and barely a voice left. 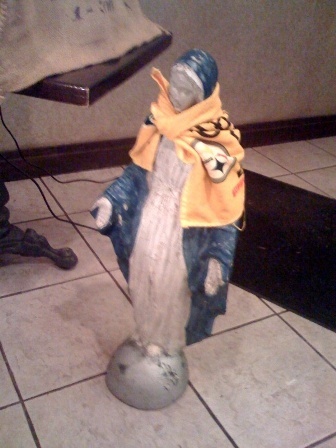 I imagine the blisters on my feet were from carrying the Virgin Mary from the front of the cafe to the back so she could sit next to our beloved Pitsburgh Steelers. That was a very special journey. It was very late in the first and the Cardnals were near our goal line getting ready to score. I said out loud, " WE need a turnover." Amy spoke up, " We need the Virgin Mary." I rushed back to her. There was no time to waste. Patricia was sitting next to her. She was very very heavy, so Patirica and I each picked up an end and began our journey to sit her next to our beloved team. We had to move fast and very carefully. Racheal shouted out," If you drop her you are going to HELL." the pressure was on and our team needed a mircle. Stay Tuned more will be rivealed!!!!!! 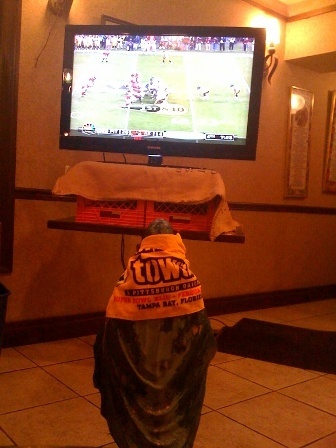 The Curse of Cope and the BVM coming down upon the Cardinals !! They never had a chance. Can we bring Mary to the competition?